Racing pigeons: treatment and control of coccidiosis. Coxi Plus should not be used in birds affected with kidney diseases. Coxi Plus must not be used during the breeding period. During treatment, birds should not be allowed to drink from other sources. It is advisable not to participate at races during the treatment of the pigeons. Persons handling this product should avoid inhalation of any dust and contact with skin. Wear either a disposable half-mask respirator conforming the European Standard EN149 or a non-disposable respirator to European Standard EN140 with filter EN143 when mixing or handling this product. Rubber gloves should be worn when mixing or handling this product. Hands and exposed skin should be washed thoroughly after use. Sulphonamides may cause hypersensitivity (allergy) following injection, inhalation, ingestion or skin contact. Hypersensitivity to sulphonamides may lead to cross reactions with other antibiotics. Allergic reactions to these substances may occasionally be serious. 2. If you develop symptoms following exposure such as a skin rash, you should seed medical advice and show the doctor this warning. No undesirable effects are seen. Do not administer Coxi Plus to parents which are feeding nestlings. 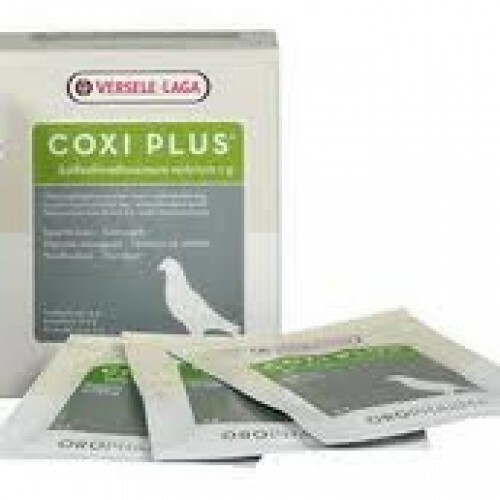 Dissolve one sachet or one spoonful of Coxi Plus in 2 litres of drinking-water (daily dose for 40 pigeons). A Coxi Plus treatment normally lasts 5 days. In case of severe infection, it is necessary to treat the birds for another 5 days after two weeks. During racing season, it's advisable to administer Coxi Plus prophylactic during 2 or 3 days monthly. The Coxi Plus solution should be renewed daily. The intake of medicated water depends on the clinical condition of the animals. In order to obtain the correct dosage, the concentration of sulphonamide has to be adjusted accordingly. Sulphonamides have a reasonable margin of safety. Coxi Plus must not be used in pigeons intended for human consumption. During treatment, birds should not be allowed to drink from other sources. It is advisable not to participate at races during the treatment of the pigeons. Any medicated water which is not consumed within 24 hours should be discarded. Indications Coccidiosis, Gastro Intestinal Infect. Do not handle this product if you know you are sensitive to sulphonamides. If you develop symptoms following exposure such as a skin rash, you should seed medical advice and show the doctor this warning.